On the ice, Barret Jackman is known as a tough stay at home defenseman who plays with an edge. Similarly, forward Austin Watson usually plays on Nashville’s fourth line, which is thrown out there when the team may be in need of some energy through physical play or to kill off a penalty. Away from the rink, Jackman and Watson have a softer side in their shared passion for shelter and rescue dogs. Between the two, they share their homes with five former shelter dogs. Dogs end up in shelters or with rescues for many different reasons, and quite often those reasons are not pleasant ones, and not usually the fault of the dogs either. But many who have gone through the process of adopting a pet from a shelter can attest to the fact that those animals just need to be given a chance. When given that chance, they can be an amazing addition to a family. “Everybody loves pets and animals, and I think when you go to the Humane Society or the rescue facilities, it’s really disheartening and you almost feel badly if you leave there empty-handed,” Watson said. While playing in the American Hockey League for the Milwaukee Admirals, Watson and his wife Karly became involved with the Humane Society of Milwaukee. And they didn’t often leave empty-handed when they visited. Shelter dogs have been known to be of mixed breed varieties, and the Watsons’ brood is no different. Bubba is a basset hound mix, Bongo is a black lab and chow or maybe a little pit bull, and they also have a Husky named Brianna. Playing his first season with the Predators, Jackman spent his first 12 NHL seasons with the St. Louis Blues. In the Gateway City, along with his wife Jenny, Jackman and several of his teammates with the Blues became involved with Stray Rescue of St. Louis. “When my wife and I got married, we were combining two houses, so we didn’t need anything for wedding gifts, so we tried to find a cause that was close to both of us and we ended up working with Stray Rescue trying to build awareness for stray dogs in St. Louis,” Jackman said. For the Jackmans, their love of animals is something that they have passed down to their children. Finding a new friend and giving that friend a chance at a forever home can be as easy as a trip down to the local shelter. The situation in 2012 was after Ryan Suter signed a deal with the Minnesota Wild as an unrestricted free agent. That day, Poile felt as though he was deceived by the star defenseman who he had assumed would re-sign with the team that drafted him with their first pick in 2003. While the Predators were on the ice playing the Colorado Avalanche Monday night, word dropped that Jimmy Vesey, Nashville’s 3rd round pick in 2012, had told the organization that he would not be signing with the Predators and exercising his right to become a free agent on August 15th. McKenzie’s tweet was sent during the first period of Monday night’s game. “We’ve kept a spot open for him, and we’ve talked about when his season ends to bring him right onto our team put him right into our lineup,” Poile said of Vesey at the time. “When you make a promise like that, you have to keep that promise. I didn’t want to trade away his spot. Acquiring a forward, a top-two line forward, for example, I think that would’ve probably not been fair to Jimmy Vesey, and I really feel with his potential, what he can do, that he was probably as good as any player I could’ve acquired at the trading deadline. Poile had to be feeling pretty confident in making the statements about Vesey just a few short weeks ago. College players with eligibility are not allowed to have agents but can have family advisors, basically ersatz agents. Addressing the media during the second intermission Monday night, Poile revealed that Vesey’s representatives gave the Predators an indication Wednesday night that for the first time, they were thinking about free agency despite the offer of a roster spot right away and the fact that he would play on one of the team’s top lines as well. Then Poile spewed some hot fire in the direction of those representatives. By signing with the Predators, Vesey would be able to tick off one year of his entry-level contract, getting a year closer to free agency. The money would be the same in Nashville as it would in any other city. Poile mentioned Monday that Suter had a financial benefit to leave Nashville, but in 2012, he said that the Predators made an identical offer to Suter. Poile also referenced that as late as Thursday that Vesey’s dad Jim, a scout with the Toronto Maple Leafs, had thought that signing with the Predators was the best course of action for his son. Further, Poile said that the team was continually rebuffed in their attempt to bring all parties (Vesey, his family, and his agents) together to discuss signing Vesey. In addition to hiring the senior Vesey as a scout, the Maple Leafs drafted Vesey’s brother Nolan in 2014. Poile said that in all conversations with Jim Vesey that he was speaking to the dad and not the employee of another NHL team. It will be interesting to see where Vesey lands August 15th. 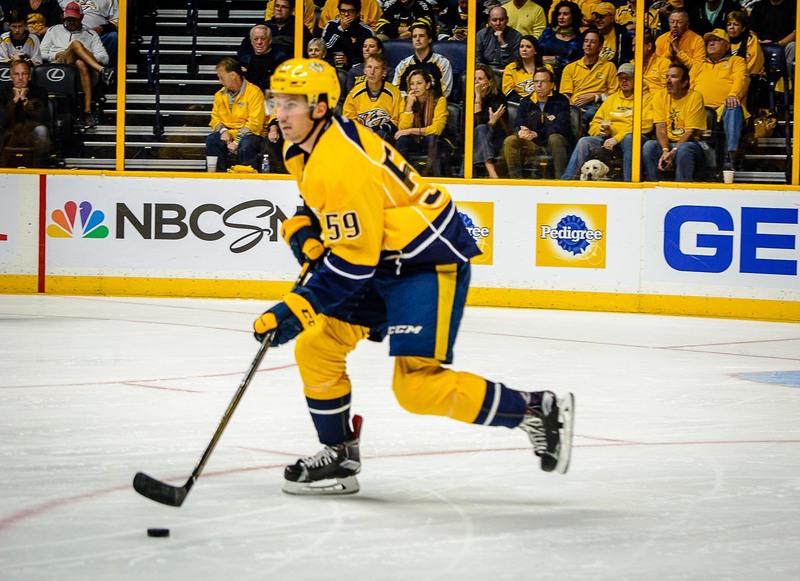 Poile did state that he would continue to pursue signing him up until that date. Not happening folks. He’s gone, leaving a general manager bewildered once again at a player not wanting to play for his team. Carter Hutton has been selected as the Nashville Predators 2015-16 nominee for the Masterton Trophy, as voted on by the Nashville chapter of the Professional Hockey Writers Association. The Masterton is given annually to the player who best exemplifies the qualities of perseverance, sportsmanship, and dedication to hockey. The award is presented on behalf of, and voted upon by the membership of the PHWA. The winner will be announced at the NHL Awards ceremony in June. Life as a backup goaltender in the NHL isn’t always glamorous, especially when you are backing up Pekka Rinne, who gets very few nights off over the course of an 82-game regular season. Save for injury or illness, Hutton’s name doesn’t often appear on the lineup card. But a big part of Hutton’s job description is to do all he can to make sure his teammates have a goaltender to work with whenever they need one. This means staying on the practice rink until all of the skaters are finished as well as working with the scratched and injured players after morning skates. During games in which he doesn’t play, fans watching on TV look forward to Hutton’s in-game hits, where he provides some perspective on the game and punctuates each visit with his should-be trademarked, “Hey, thanks for having me guys,” phrase. In the offseason, Hutton runs a hockey school for charity in his hometown of Thunder Bay, Ontario. Hutton’s charity of choice is the Boys and Girls Club of Thunder Bay. Last summer, Hutton and the NHL Players Association donated goaltender equipment to every minor hockey association in the Thunder Bay area.